Bulgarini Gelato, a modest shop tucked inside the alley way of a strip mall in Altadena, CA, may be the reason I never eat store-bought ice cream again. The gelato from this hole-in-the-wall store blew me away. Husband-and-wife team Leo Bulgarini and Eliabeth Foldi select the finest ingredients from around the world for their products, starting with milk from Broguiere’s Dairy in Montebello, CA. 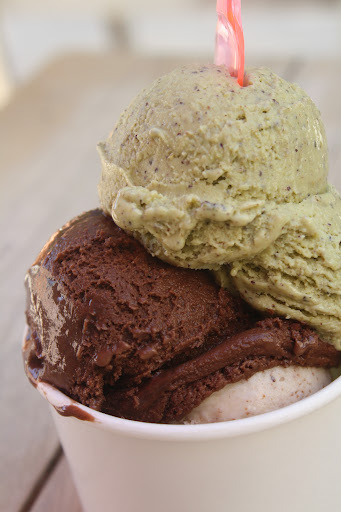 Unlike traditional ice cream, which contains 18-22% milk fat, Bulgarini’s gelato hosts only 2-4% milk fat. The low fat concentration allows the high-quality nuts, fruits, and chocolates to take center stage. The acclaimed pistachio gelato tastes like an handful of aromatic pistachios, hand-picked and imported from Sicily, have been freshly ground into each bite. The rich dark chocolate gelato is sophisticated and sinful all at once. The goat’s milk with cocoa nib gelato is earthy but not overbearing. A small serving at Bulgarini starts at three golf-ball-sized scoops, forcing you to choose from a plethora of possible flavor groupings. If you become as overwhelmed as I was during my decision process, the patient and friendly staff will surely answer any questions you have. They are generous with samples and describe each flavor in detail to ensure that you enjoy your experience to the fullest. With its amiable employees and incredible gelato, Bulgarini is simply without parallel in L.A.
Monday-Thursday, 12 p.m. – 9:30 p.m.
Friday-Saturday, 10 a.m. – 11:30 p.m.
Sundays, 10 a.m. – 9:30 p.m.
1. Preheat the oven to 425 degrees. Butter a baking sheet or line with parchment paper. 2. In a heavy saucepan over medium heat, combine the sugar, milk, water, salt and butter until the butter melts and the mixture comes to a full boil. Add the flour all at once, stirring vigorously with a wooden spoon. Keep stirring until the mixture has formed a smooth mass and pulls away from the sides of the pan and some of the moisture has evaporated, about 3 minutes. Transfer to the bowl of a standard mixer fitted with a paddle attachment. Add the eggs one at a time and mix at medium-high speed, incorporating each egg before adding the next. Once all the eggs have been added, transfer the dough to a pastry bag fitted with a half-inch tip. Pipe out fingers about 5 inches long and 1 inch wide, spacing them about 2 inches apart. If you end up with a bulge or tail at the end of the piping, smooth it over with a damp fingertip. 3. Bake the fingers until puffed and starting to show some color, about 10 minutes. Reduce the oven temperature to 375 degrees and continue to bake until the shells feel light for their size and are hollow inside, an additional 12 minutes. They should be nicely browned all over. Remove from the oven and, using a metal skewer, poke a small hole in the end of each shell to allow steam to escape. Let the shells cool on wire racks. 4. To make the pastry cream, pour the milk into a heavy saucepan. Split the vanilla bean lengthwise and use the tip of a sharp knife to scrape the seeds from the pod halves into the milk. Add the salt to the mixture, place the pan over medium-high heat, and bring just to a boil, stirring occasionally and making sure that the milk solids are not sticking to the bottom of the pan. 5. In a mixing bowl, whisk together the cornstarch and sugar. Add the eggs and whisk until smooth. When the milk is ready, slowly ladle about one-third of the hot milk into the egg mixture, whisking constantly. Pour the egg-milk mixture back into the hot milk and continue whisking over medium heat until the custard is as thick as lightly whipped cream. Remove the cream from the heat and immediately pour it through a sieve into the bowl. Let cool for 10 minutes, sitting occasionally to release the heat and prevent a skim from forming on top. 6. Cut the butter into 1-tablespoon pieces. When the pastry cream is ready, whisk the butter into the cream 1 tablespoon at a time, always whisking until smooth before adding the next tablespoon. To cool the cream, cover the bowl with plastic wrap, pressing the wrap directly onto the top of the cream, and place in the refrigerator. It can be stored in the fridge for up to 5 days. 7. To make the chocolate glaze, combine the chocolate and corn syrup in a heatproof bowl. Bring the cream to just under a boil in a small saucepan. Pour the cream over the chocolate. Let the mixture sit for about 2 minutes without stirring until the chocolate melts, and then stir gently with a rubber spatula until smooth and shiny. 8. To complete the eclairs, stir the cooled pastry cream until smooth and then spoon it into a pastry bag fitted with a 1/4-inch opening. Fill the shells by splitting them in half lengthwise with a serrated knife. Dip the top half of the shell in the glaze and then place upright on a wire rack and allow the glaze to set. Pipe the cream into the bottoms of shells and replace the glazed tops. Serve the pastries at once, or refrigerate for up to 6 hours before serving. Ideally, they should be eaten the same day they are filled. With so many wonderful recipes available online, old-fashioned cookbooks can often be neglected. The beautiful photos, relatable descriptions, and daily updates of food blogs make it easy to forget about the dusty stack of books scrunched in a corner of the kitchen. So how was it that I woke up yesterday morning, picked Tartine off the shelf, and decided to make a pastry tucked away in the back of the book without a single accompanying photo? Well, I had the feeling, the emotion that only a baker can describe when a recipe just feels right. When an item speaks to you immediately: no second-guessing or unsureness, no mental processing if you have all the ingredients on-hand, just eagerness to get to work and eventually enjoy the fruits of your labor. With that mindset, I embarked upon making this quintessential Parisian dessert. 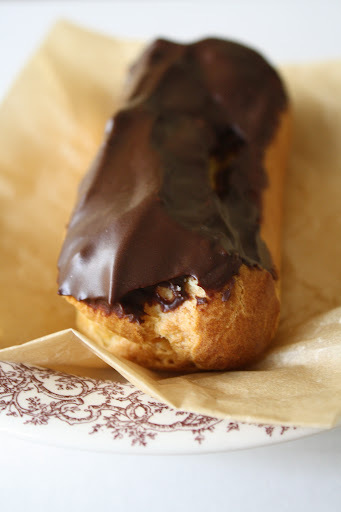 I performed each step slowly and carefully to ensure that I created the perfect éclair. My diligence paid off in the end; these delicate puff pastries were fabulous. The dough is barely crisp on the outside and turns soft as you sink your teeth into the decadent vanilla bean pastry cream on the inside. And of course, everything is better when dipped in chocolate. As a result of this experience, my cookbook collection has earned a more prominent spot in my kitchen. 1. Preheat the oven to 350 degrees. Line two 12-cup muffin tins with paper or foil liners. In the bowl of an electric mixer equipped with a paddle attachment, beat the butter and sugar until fluffy. Mix in the vanilla extract, food coloring, and vinegar. 2. In a large bowl, combine the flour, baking soda, and salt. Sift the cocoa powder into the bowl (this step is very important because you do not want to end up with a clumpy batter). Mix these dry ingredients together and gradually add them to the butter mixture, alternating with the buttermilk. Once combined, beat in the eggs. 3. Fill lined muffin tins 3/4 full with the batter. Bake for 15-18 minutes, or until a toothpick inserted into the center of a cupcake comes out clean. Once finished baking, remove the cupcakes from the tins and place on wire racks to cool completely. 4. 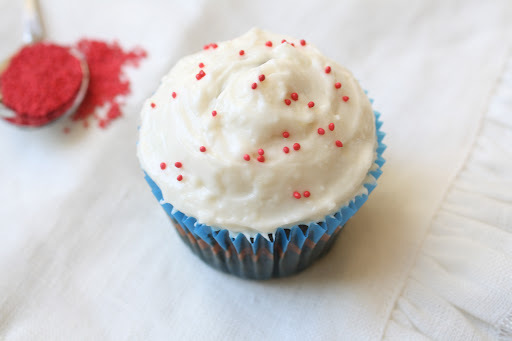 For the frosting: In the bowl of an electric mixer equipped with a paddle attachment, beat the butter, cream cheese, and vanilla extract until fluffy. On low speed, gradually add the sifted sugar to the mixture and beat until fully combined. Frost the cupcakes and top with sprinkles, if desired. You know what I love more than baking? Sharing my baked goods with others. I relish the moment I arrive at school or at a party with a fresh batch of homemade treats. I love seeing the smiles on peoples’ faces as I unveil my creation and watching as they enjoy the special goodie. Some ravenously gobble sweets down and some carefully savor each bite. Either way, I feel satisfied having brightened someone’s day with a delicious item that came from my kitchen. So you can imagine my excitement when I walked into school on Friday holding a tray lined with these dainty red velvet cupcakes. Super airy, cloud-like, and topped with a rich vanilla cream cheese frosting, these cupcakes are superb. 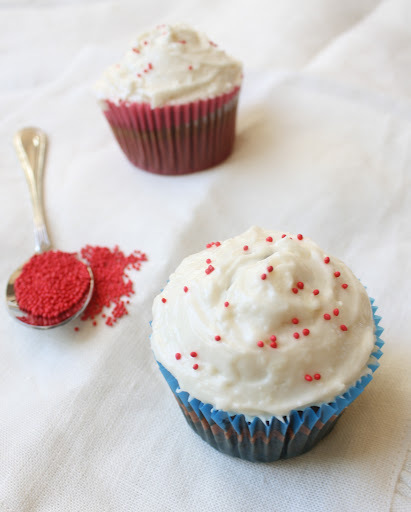 The six eggs beaten into the batter create the ever-so-light texture and perfect moistness that distinguishes them from several others red velvet cupcakes I have tried. To finish, a spoonful of vanilla cream cheese icing smeared on top complements the fluffiness of the cake perfectly. In short, get to the kitchen, make these cupcakes, love them, and sit back and relax when others love them just as much as you do.